Marriage, it seems, just might save you. A healthy marriage consisting of love and affection along with mutual respect is not just mentally satisfying, but physically as well. There are associated multiple health benefits of marriage, including greater survival chances of illnesses like cancer, better heart health, and immune system However, it is best to rid oneself of the toxic marriages that otherwise might instead jeopardize the health of the couple. Married couples who have been together for long have lesser calcium deposits in their arteries, as opposed to their single contemporaries. They, therefore, are at lower risks of having a heart attack. Furthermore, stress is an important factor in the clotting of the blood. As in a satisfying marriage, there is less stress, hence those couples are again, at a reduced risk of heart diseases. They are also less likely to suffer from broken heart syndrome. Due to the strong support system, the recovery of married patients is greatly increased as well, and their stay in hospital post-surgery is less. With a caring spouse, the patient has someone to turn to when feeling scared regarding any procedure. Such patients are thus more accepting of the hospital treatments, and have better post-operation care, averting any further risks which is why they have fewer readmissions after heart surgery. The married couples, as opposed to the single people, have reduced risk of strokes. Married men are 64% less likely have a fatal stroke than single men. 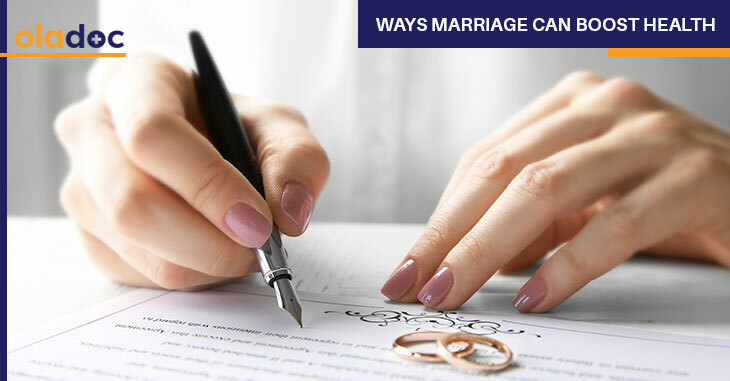 Marriage offers stability in terms of finances and emotions. The patients are therefore more likely to take the medication for the treatment. They also have better care, and often the spouse can report any irregularities in the health and so are able to seek timely medical aid. Stress can wreak havoc on the health of the individual, exposing them to multiple health risks. Therefore, reducing the stress levels can help prevent multiple diseases including heart diseases, depression and anxiety. Married couples had overall less cortisol—the stress hormone- levels. They also have reduced chances of substance abuse which often results from high-stress levels. Intimacy also helps lower stress levels. Married people are less likely to suffer from mental illnesses like depression and anxiety due to decreased stress levels. Moreover, marriage provides with social support, which wards off loneliness and social isolation. This improves the mental (and physical) health of the people. Married people tend to have better immunity and therefore better physical health. High cortisol levels can compromise immune functions. Since marriage normalizes these levels, it, therefore, improves the immunity of the people. Having a satisfied marital life can yield a lot of benefits. Being social animals, we all need social support provided by a satisfying married life. If you need help from experts to deal anxiety or stress regarding your marriage, then book an appointment with top psychiatrist in Lahore, Karachi, and Islamabad through oladoc.com, or call our helpline at 042-3890-0939 for assistance to find the RIGHT professional for your concerns.